1. Determine a context sensitive improvement vision for each of the study corridors. 2. Determine a prioritized list of projects so to implement those visions. 3. Create final products for use by the SDGF&P, USFS, USNPS, FHWA, and the SDDOT which will provide guidance to implement recommended improvements for future construction. 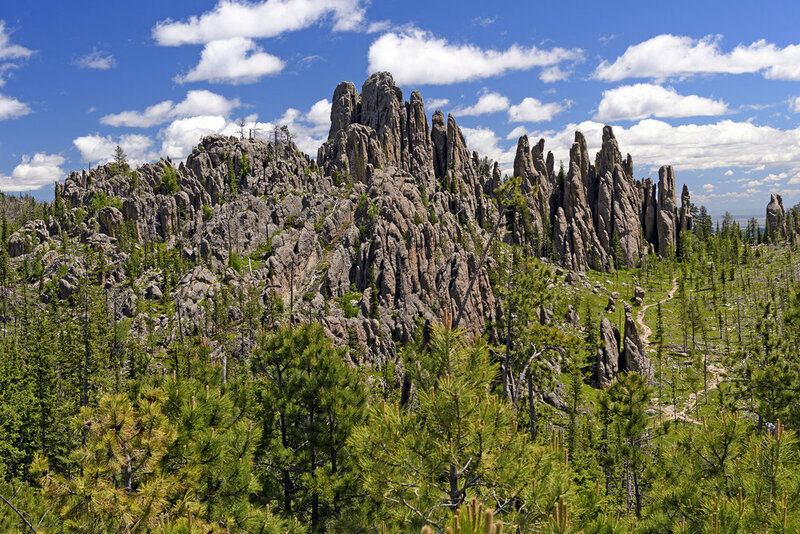 There are a few routes in the Black Hills where terrain and/or other environmental hurdles make obtaining the SDDOT’s typical section for the roadway’s classification and traffic level problematic. Many of these routes are also routes that the Department often receives requests for roadway widening to better accommodate bicycle travel and /or the installation for passing lanes, pull outs, scenic overlooks, pedestrian crossings, and traffic calming. The Department’s pavement management system is starting to recommend some of these routes for major pavement work. It is thereby prudent to investigate what, if anything, can be done to upgrade these routes to get them closer to current design standards, improve safety, and better accommodate the desires of all roadway users while still maintaining context sensitivity to the surrounding environment.